When Alexa and I hosted our Fall into Fantasy event, I mentioned that a mermaid was the magical creature I'd most like to be - and that I didn't think I'd ever read any mermaid books! 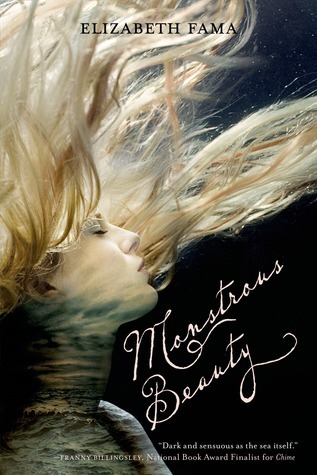 Well, the lovely Elizabeth Fama commented that she'd love for Monstrous Beauty to be my first mermaid book and would even send a copy my way. I was thrilled! I'd long admired the gorgeous cover and had read many wonderful reviews for it, so I couldn't pass up on the opportunity to read it. Monstrous Beauty successfully blends several genres - weaving together a contemporary heroine, a supernatural mystery and a historical backstory. The heroine, Hester, discovers a startling trend of early death in the women in her family and embarks on a search for answers. There was so much about this book that wasn't what I expected, but in the very best way. Fama's writing is lyrical and haunting, perfectly establishing the tone for the story she's telling. I liked that the story was darker and more intense than I would have expected, and I thought Fama made the setting, characters and folklore come alive in these pages. While I wasn't always a fan of the main character or the romance, it didn't diminish my overall enjoyment of the book. I'm so glad that it was my first experiences with mermaids! Prior to BEA last year, I was researching books that were already getting some buzz. I wasn't attending the conference, but I wanted to know what I'd likely see everyone reading and reviewing in the weeks and months to come! While this wasn't one of the "hyped" books, I came across a lovely review of it that made me curious. I put it on my mental radar and went on my way. Months later, I was browsing in Barnes and Noble with my husband and came across this book. I'll admit - I was surprised! I hadn't heard of the publisher before and never saw many reviews for the book. It's not often that I find lesser-known books in a major bookstore, especially in the Young Adult section. I read the first few pages and found that I couldn't put it down. There was something about Pérez's writing that drew me in, so I decided to buy it. I couldn't write my review for it immediately after I finished it because I felt a little conflicted. Let me try to explain. 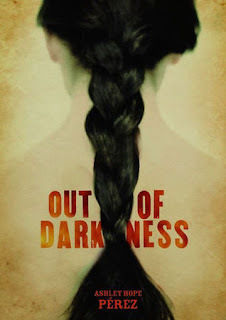 There are aspects of Out of Darkness that absolutely blew me away. It's a historical fiction book set in Texas and uses the events of the New London school explosion as "a backdrop for a riveting novel about segregation, love, family, and the forces that destroy people" (because the blurb says it best). And honestly, that's all true. The writing in this book was stunning. I can't praise Pérez enough for the character development, the way she formatted this story, and how she truly immersed me in this world. And yet... Out of Darkness explores some very heavy themes. They're handled thoughtfully, but they made for such difficult reading. I'd have a hard time putting this book in someone's hands and urging them to read it. Is it worth it? Yes, I think so. But I felt so uncomfortable and heartbroken while reading it that I can't say that I liked the experience. I'm glad I picked it up and truly believe it's deserving of the accolades it has received (2016 Printz Honor for Excellence in Young Adult Literature), but the brutality and bleakness was tough. The things that made this book so compelling were the same things that made me want to put it down. And how do you rate it and recommend a book like that? "Wash never got tired of the woods. There was the beauty of the place and also the pleasure of finding things. The woods had a way of grabbing bits out of pockets and scattering them for other people to come across." I didn't grow up reading the Harry Potter books. It wasn't until I was out of college and married that I first picked up the series - and that was after I'd already seen all the movies! (I know, you're judging me a little.) Of course, once I started the first book, I couldn't put them down. I could see exactly why these characters had become so beloved! 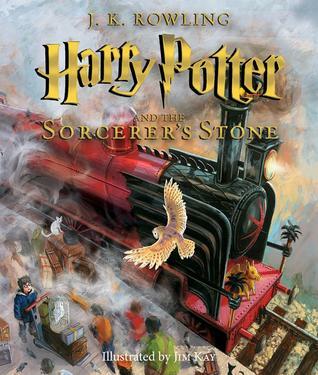 When I found out about the release of the illustrated edition of Harry Potter and the Sorcerer's Stone, I was so excited... and that only increased the more sneak peeks I saw of the inside. I pre-ordered a copy (of course) and finally sat down to re-read it (for the first time!) earlier this year. Thankfully, it was a fantastic experience. Jim Kay's illustrations are absolutely gorgeous and bring this book to life in a way I never could have imagined. The amount of detail that went into every single page is just astounding! I read through the book more slowly than normal just so that I could savor Kay's artwork. It made me even more excited for the release of the illustrated editions of the rest of this series, and I know it will become something I look forward to every year. As for the book itself, I loved it just as much the second time around. I have no doubt this was the first of many re-reads to come! I haven't heard of Out of Darkness, but yay for Harry Potter! I'm glad you really liked it! I still want to reread it, since I haven't read it since elementary school I think. I love mermaid stories, and I've never heard of Monstrous Beauty until now. Thank you for sharing it!